Alok is Co-founder and CEO of Indifi, India's leading full-stack platform for enabling debt financing for small businesses. Alok is also an active angel investor, co-founder of Indian Angel Network, and on the board of TiE (The Indus Entrepreneurs) Delhi. Prior to starting Indifi, Alok setup and ran Canaan Partners' venture investment business. 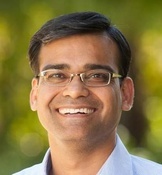 Earlier, Alok co-founded JobsAhead.com, a leading web-based recruitment business in India.Alok earned a BE in computer science and engineering from the Indian Institute of Technology Delhi and a MS in computer science from UC Berkeley.